Sean, Khaliq, Paulina, me and Henry .. ready for action! Yup, DNF’d this weekend. Shame about that, because I was feeling good and started off well. 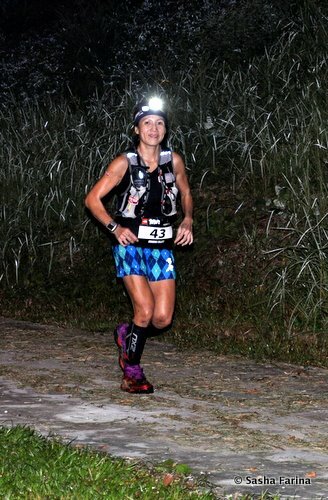 I rocked up to Macritchie Reservoir about 11.40pm Friday night. Registration was meant to be 12 midnight so no reason to think that I was too early. A sense of deja vu as I get out of the cab and there’s no one to be seen. No signage or anything, nothing new from last year, then. I see another runner walking ahead and we both take a different route to where the start/finish gantry was last year. There’s a surprising lack of activity, and further along the tentage for refreshments and the 100km solo pitstop is still waiting to be set up and manned. No one seems to be able to answer our questions and there are now 5 runners sat waiting. Finally someone comes along to say we can leave our bags in a corner, and the girl left in charge is told that she’s got to look after all our stuff. I find a spot and lay my kit out, the forecast was for rain after 6am, so dry shoes, socks and clothes at the ready just in case. It was good to see familiar faces and meet new people that morning. I do wish the runners I know from Facebook would introduce themselves .. it’s hard to recognise who’s who if I don’t see you that often! Andre is there to complete his TNF Grand Slam .. the final finishers medal for his stash. 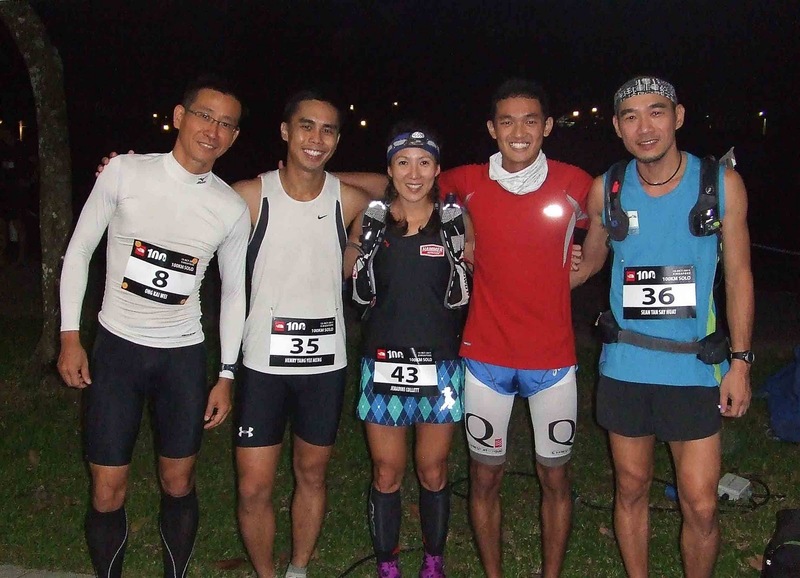 Khaliq, the young contender .. Henry, Sean, DJ Wee and Paulina, the midnight LSD posse … ultra brothers Sean (in huaraches!) and Kai Wei .. this was going to be fun! Forgot to charge my camera batteries so not many pics, I’m afraid! The start was counted off by the race director, but he didn’t give a definitive ‘Go’ or blast a whistle or horn or anything, so we all sort of looked each other and then off we went. Henry and the men’s champion from TNF Beijing took off at a blistering pace, followed by last year’s winner Hisao Yamanaka. 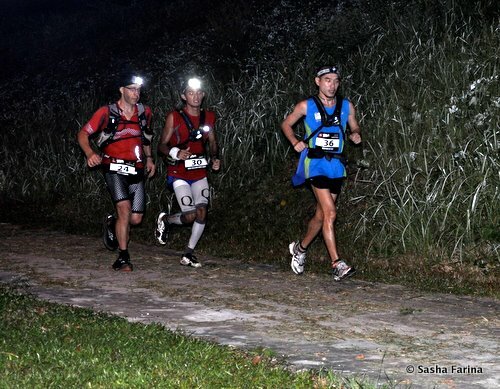 I see Andre, Sean , Khaliq and the women’s champion from TNF Beijing go past as well. I’m taking it easy, I figure a steady sub-12 hour run would keep me happy. 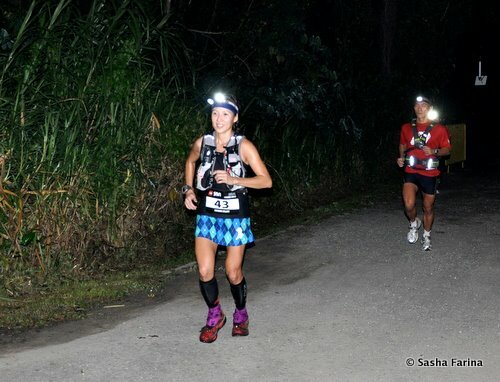 I really enjoy racing in the dark. this time I’ve got brand new batteries and clipped an extra headlamp on for better visiblity. It’s to my advantage that I know most of the course and I can hear the hesitation of the runners behind whenever we get to a tricky bit. I try to shout a warning wherever I think the non-local runners might need it .. not really sure who’s behind me apart from Allan, a first-time TNFer from Malaysia. Allan had asked if he could run with me when he caught up early on, since our pace seemed similar. I was glad for the company, and he’d prove to be a real help later on. Alls well, first 10km in under an hour .. a little quicker than I should’ve gone, but no harm done. The route’s not particularly well marked or marshalled, and unlike last year, none of the directional signs are reflective. This means you don’t know where you’re going until you’re nearly at the sign .. from a non-local viewpoint, there’s far too much scope to get lost. There was also a strange chap halfway along the Durian Loop .. did anyone else see him? He was wearing a black hoodie (hood up) and dark shorts and had his back to us as we came down the trail round a corner. I saw him out the corner of my eye in the light from my headlamp as I ran past. As Allan ran past him we heard him make a funny sound and I’m pretty sure it unnerved Allan a little. If I’d been running alone he would’ve definitely scared the pants off me! Whoever it was … not a funny stunt to pull! 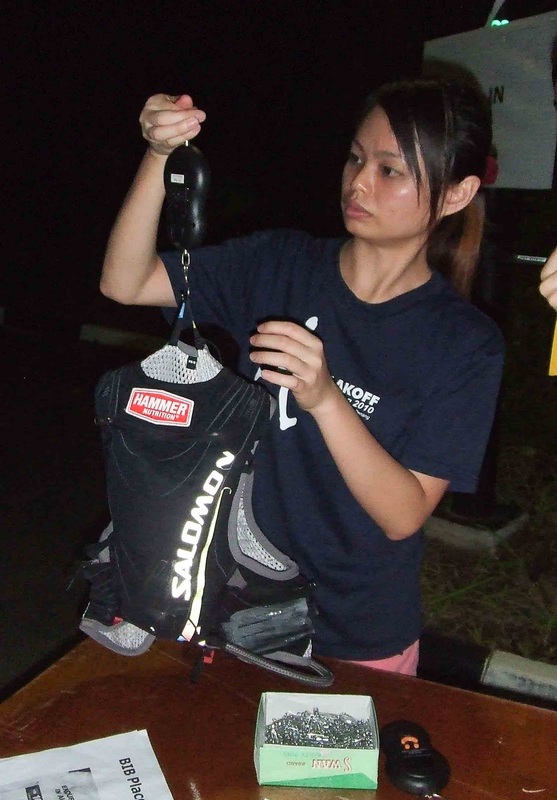 Somewhere along the MTB trail in Bukit Timah I trip over something in the dark and go flying. Get up, start running. I know from experience that the pain from bruising will subside after a while and if I keep running it should all feel fine in a bit. Except it doesn’t. I’m still trying to assess the pain when Sean (with the huaraches) and someone else run past. I drop my pace a little to see if it helps. Arm: bruised, but should be fine. Right knee: Feels cut up but no major damage. Left knee: Feels like it took the brunt of my fall and not feeling good at all. Left ankle: sore but bearable. It’s back to Allan and I again and we run through Zhenghua Park towards Mandai. I always worry about wild dogs on this bit, and am grateful for Allan’s company as we exchange small talk. Getting to CP4, Paper and Charlie (Andre’s crew) are there cheering. There’s no directional sign after the CP and I follow the runner ahead at the traffic light crossing to turn right. There’s a few more runners up ahead so I guess we’re on the right track. Up to this point, I’m appalled at the lack of signage and marshall at crucial junctions. Through the Ulu Sembawang Park Connector and at the end we reach the SLE and a traffic light junction. No markers, no idea. I go right as there seems to be a trail there and it just leads us back to where we just came from. Allan and I check our maps and realise we should have gone left instead. Back tracking to the junction, we meet another runner who’s consulting the Park connector map board. We all decide on the route forward and after another 200-300m spot a lightstick that indicates we’re on the right track. That really wasn’t adequate, and I worry about the other runners getting lost. So now we’re in Lorong Asrama and my knee and ankle are really bothering me. It’s getting harder to keep a steady pace. Allan is having trouble staying awake so I give him a caffeine pill. We get through CP5 and head back to CP4. By now I’m getting shooting pains in my knee and ankle and have to walk sections to ease the pain. Getting out of Lorong Asrama, I have to direct the way as again, there is no signage. Even when we get to the traffic lights it’s impossible to spot CP4 as they have no lights on. What gives?? Is this some kind of Special Ops race?? I apply some ice to my knee at CP4 and try to tell an official about the lack of markers. He says he’ll make a call. I’m there icing my knee a few minutes and don’t notice him making any calls. Allan’s doing a great job pulling me along at this point, and it’s also obvious that the caffeine’s kicked in! He’s got a bounce to his step and is very chatty. I tell him to go ahead if he’s feeling good, but he elects to stay with me for the company. He’s here to finish and not worried about his finish time, and given the lack of signage so far, he reckons he’s better off going slow with me. So on the way back, we get passed by a few more runners. I can’t keep pace and settle for a run/walk strategy. I figure I’ll see how I feel further along and decide if I should go on or not. Ice on my knee at every CP, and feels like an age before we’re back at the start of Rifle Range Road. More ice at CP1, Back into Macritchie and another fall from me just 200m from the CP. No serious impact this time, but it feels like I’ve definitely added to the existing damage on my knee and ankle. I try to run normally as more stuff starts to hurt if I compensate with my right leg. Think it’s time to face the facts. I could stick this out, finish and most likely incur an injury that’ll have me sidelined for a while … or I could pull out and save my legs anymore abuse. I’m not worried about a DNF here, I have nothing to prove. I’ve achieved my main racing goal this year, and definitely feel that I could quite comfortably go sub-12 on this course. No brainer, then. Live to race another day. It’s light enough now to run without headlamps on and 3 miles back to the halfway mark. The last leg goes much quicker only because I know the end is close and I can stop. The leaders go past, the China champion and Hisao, followed by Kai Wei, Andre, Khaliq and Sean. It’s good to see my friends doing well! 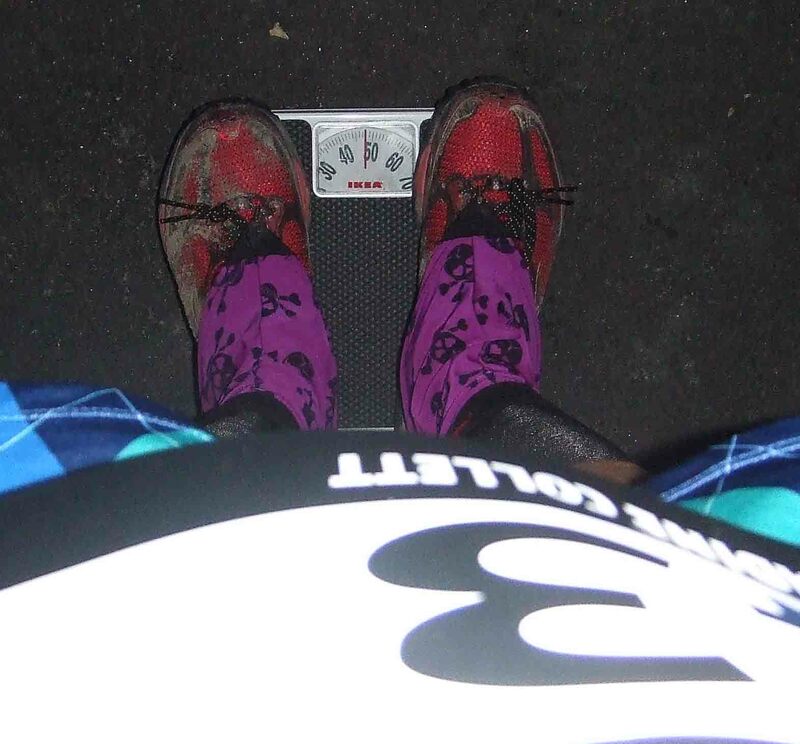 I’m suddenly reluctant to DNF, and would like to keep running with Allan, but I remind myself of my reasons to stop. Oh well. 50km in 6 hr 20 mins, could’ve been worse. Running toward the start/finish gantry, it’s still a shambles. The 100km duo runners assembling for their start, there was no signage for the 100km solo runners, the area was crammed with runners. It wasn’t a problem for me because I knew I was pulling out, but what about the three Aussie runners I’d met that morning? They’d come specially for the race and it was their first look of the course. I got some ice for my knee and went to see the start of the 100km duo. They started late and as an afterthought someone began pulling the metal barriers out to create a small chute for the 100km solo runners coming in .. who were very likely to get caught in the tide of runners going the other way. The runners lined up at the start gantry tape, and when they were given a start signal (again, no whistle, horn or any sort of definitive sound), there was no one there to untie the tape so the runners in front had to lift up the tape on their own and someone managed to loosen it enough that it came off in the end. Like I said, it was a shambles. 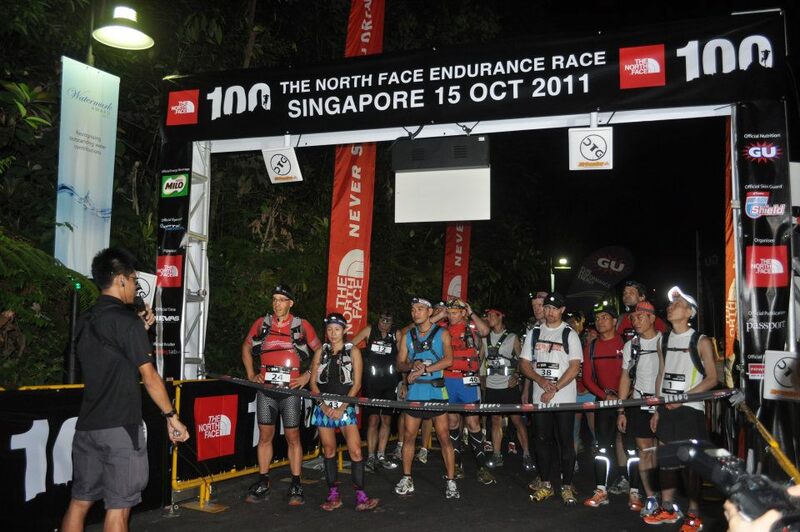 TNF100 Singapore was badly organised and executed, and for an international level race it was a disgrace. 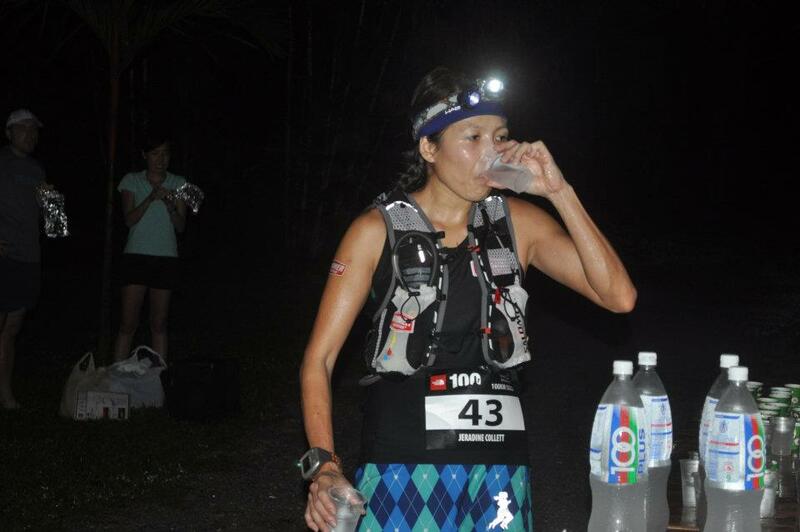 I had no issues because I knew the course and didn’t need anything from the aid stations apart from water. 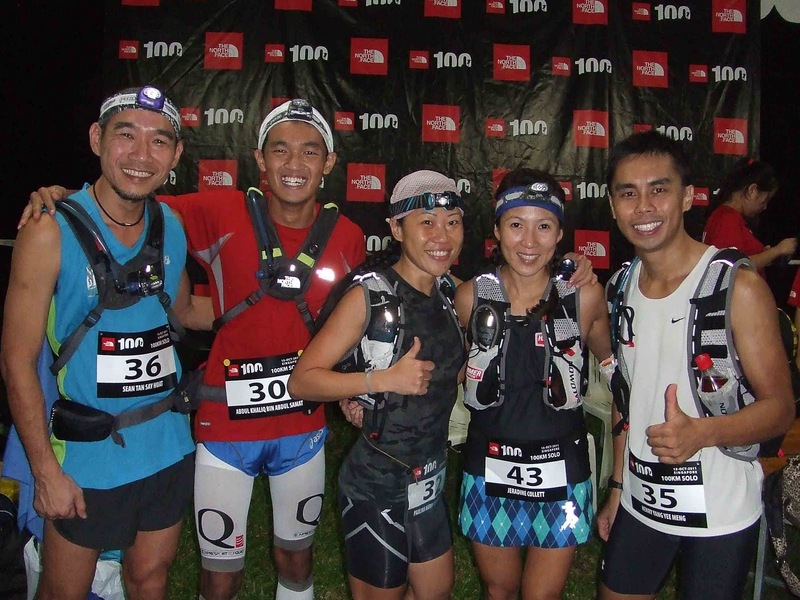 But for runners like Allan, Andre and the Aussies, it really wasn’t fair to come all this way and have to deal with organisational flaws during a 100km race. C’mon North Face Singapore, step up to the challenge! Anyway, it's a good decision to quit. Running with injury will just get you out of action longer, and maybe permanent injuries. Great to see you there! Thanks for your dried prune offering at the 100km solo resting tent while I was taking my own sweet time taping my feet (the longest transition as you claimed lol). Wishing you a speedy recovery! Love your gaiters! were they improvised out of Buffs? Hey fatbird, Kilian jornet is coming to KL on 24 Oct. He is giving a talk in E-Curve, after which he would do some running in Bukit Kiara with 5 lucky runners. For more info on how to participate, go to world of sports malaysia facebook. It's once in a lifetime opportunity to run next to him.